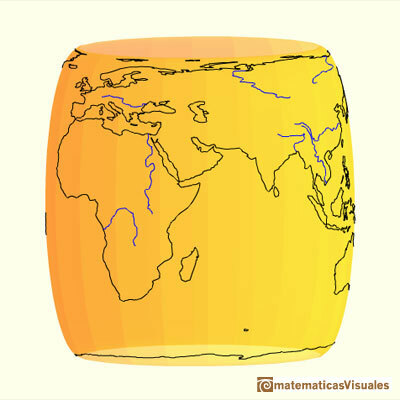 We are going to study a projection from the sphere to the cylinder. 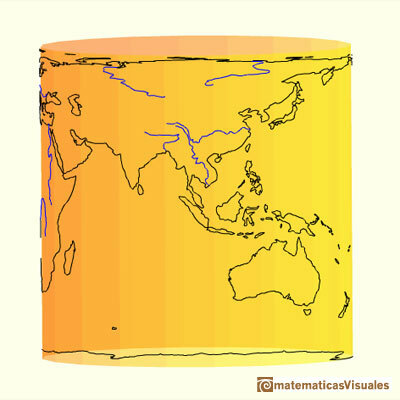 This is a kind of perspective cylindrical projection. 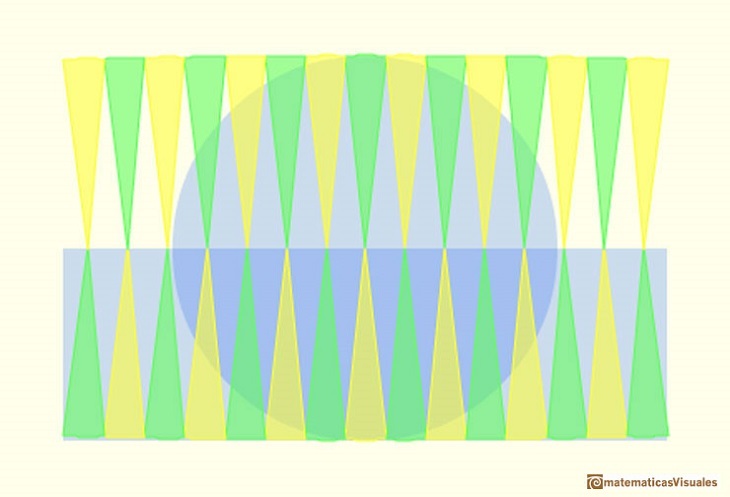 Each point on the sphere is projected horizontally onto a cylinder tangent to the sphere. 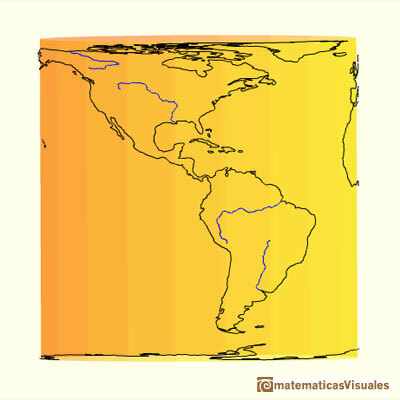 It is an equal-area projection that was first rigorously defined by Johann H. Lambert (1772). 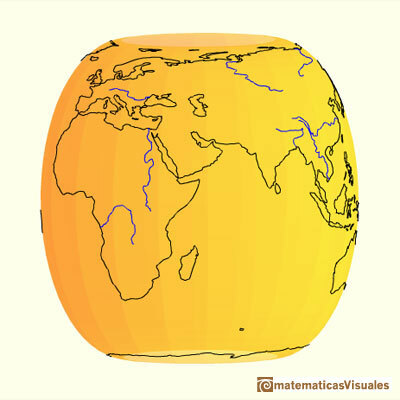 "If we place a sphere in a cylinder touching it along the Equator, and if we project the sphere on the cylindrical surface by prolonging the planes of every parallel to cut the cylinder and do the same with all the meridian planes, we get on the cylinder a map of the sphere. By cutting the cylinder open and laying it flat, we get a map of the sphere with a rectangular and straight net of meridians and parallels. This map has the peculiarity (known to Archimedes) of conserving areas. If we then imagine the sphere covered with a thin uniform layer of paint or clay and bring every particle of it to its proper place on the cylinder, we shall get a uniform covering of the cylinder with matter; if we transfer it horizontally back to the common axis of the cylinder and the sphere, we shall cover the axis uniformly with matter." In his book 'On the Sphere and Cylinder', Archimedes demonstrated the formula for the surface area of a sphere. 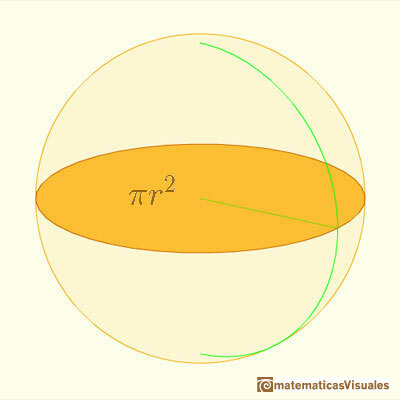 This surface area is the same as the lateral surface area of the tangent cylinder and it is four times the surface area of a great circle in the sphere. After that we can use an intuitive argument to deduce the volume of a sphere. "The relationship between V and the surface area S is sugested by a heuristic argument similar to the one in the discussion of the area and the circunference of a circle. 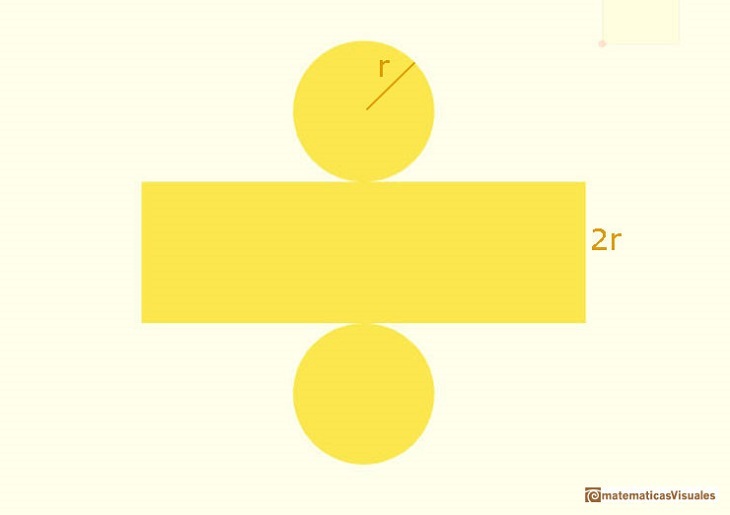 Kepler used an intuitive infinitesimal approach to calculate the area of a circle. 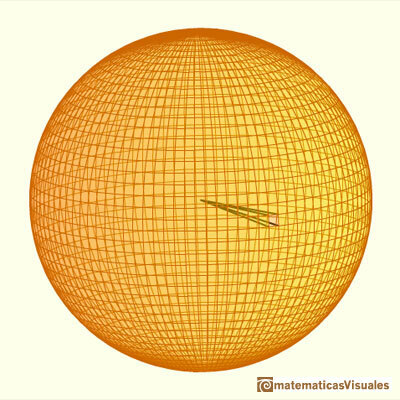 We regard the sphere as approximately the union of indefinitely many pyramids with the center of the sphere as their common vertex, and with their bases forming a polyhedral surface with indefinilety many faces inscribed in the sphere, each of which almost coincides with a small piece of the sphere. Then we can derive V from S. Archimedes in his book 'The Method' followed the opposite direction and derived S from V.
Although in Kepler's times Archimedes' 'The Method' was lost, Kepler followed a very similar argument to deduce the surface area of a sphere. Kepler was one mathematician who contributed to the origin of integral calculus. He used infinitesimal techniques for calculating areas and volumes. Kepler wrote a book in 1615 about areas and volumes of surfaces and solids: Nova stereometria doliorum vinariorum (New solid geometry of wine barrels). In this book Kepler thought of the sphere as being composed of an infinite number of infinitesimal pyramids or cones each having its vertex at the center of the sphere and whose bases made up the surface of the sphere. This is one example of a theorem about the sphere in one original Kepler's Nova stereometria doliorum vinariorum. We can read this page, and the full book, in The Posner Memorial Collection,Carnegie Mellon University Libraries. 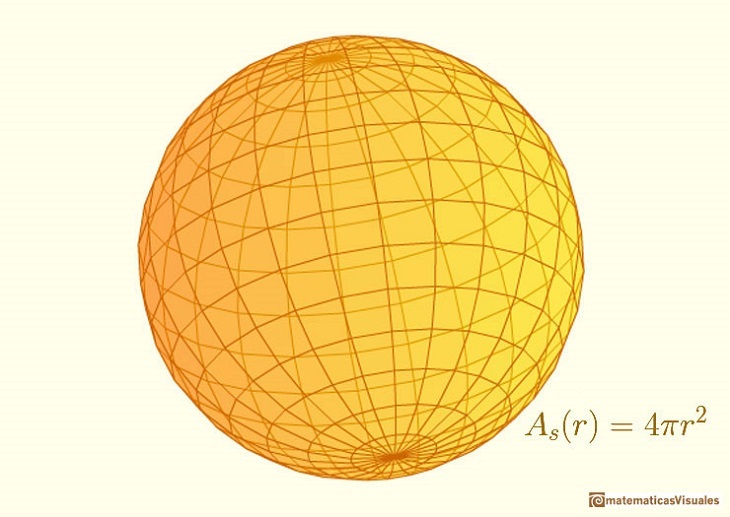 A translation could be: The surface area of a sphere is four times the area of a great circle of the sphere. 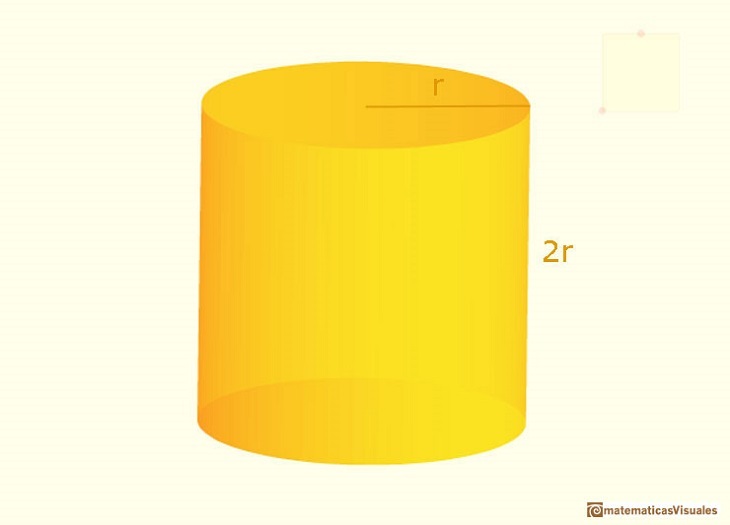 The ratio of the surface areas of the sphere and the cylinder is the same as the ratio of their volumes. Archimedes was very proud of these results and he requested that on his tombstone be carved a sphere inscribed in a right circular cylinder whose height equals its diameter. Archimedes - On the Sphere and Cylinder in The Works of Archimedes edited by T.L.Heath - Dover Publications. C.H. Edwards - The Historical Development of the Calculus - Springer Verlag New York 1919 (pp.42-54). Hugo Steinhaus - Mathematical Snapshots - Oxford University Press - Third Edition (p. 221). B.L. Van der Waerden - Science Awakening (pp.220-222). 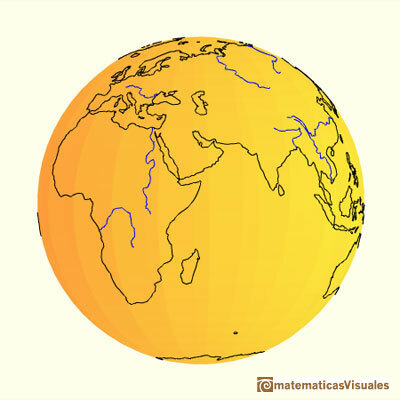 Map Fold-outs in Furuti's web site about Map Projections. 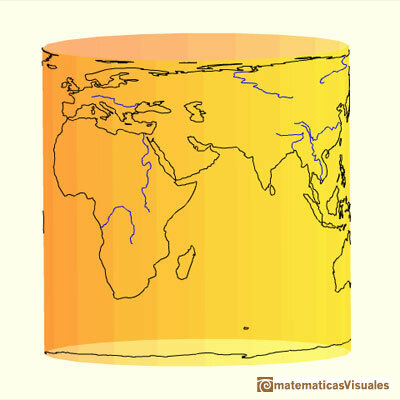 For example, Lambert's Cylindrical Equal-Area Projection. 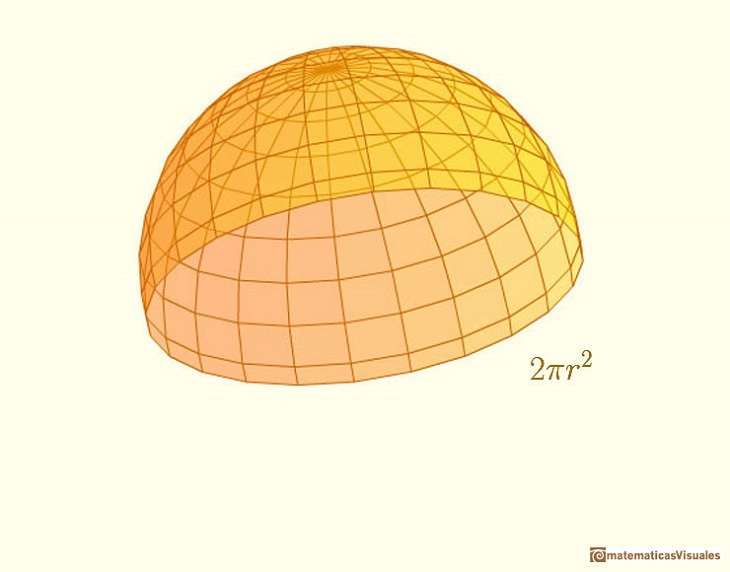 Archimedes on Spheres and Cylinders in MathPages. 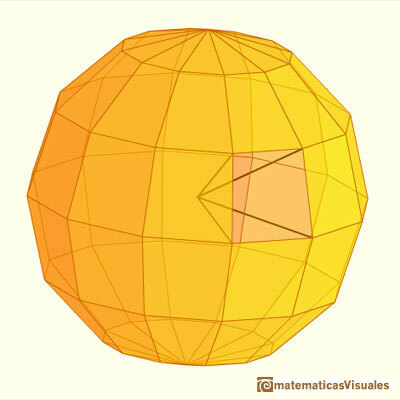 We study a kind of polyhedra inscribed in a sphere, in particular the Campanus' sphere that was very popular during the Renaissance. 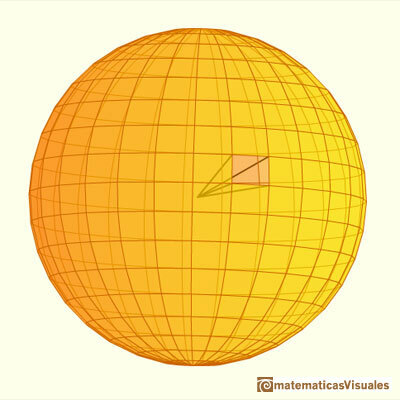 We want to calculate the surface area of sections of a sphere using the Pythagorean Theorem. We also study the relation with the Geometric Mean and the Right Triangle Altitude Theorem. Leonardo da Vinci:Drawing of a SEPTUAGINTA made to Luca Pacioli's De divina proportione. Leonardo da Vinci made several drawings of polyhedra for Luca Pacioli's book 'De divina proportione'. Here we can see an adaptation of the Campanus' sphere. We study different cylinders and we can see how they develop into a plane. Then we explain how to calculate the lateral surface area. Studying the volume of a barrel, Kepler solved a problem about maxima in 1615. In his article 'Two Surprising Theorems on Cavalieri Congruence' Howard Eves describes an interesting tetrahedron. In this page we calculate its cross-section areas and its volume. Howard Eves's tetrahedron is Cavalieri congruent with a given sphere. You can see that corresponding sections have the same area. Then the volumen of the sphere is the same as the volume of the tetrahedron. And we know how to calculate this volumen. Special sections of a tetrahedron are rectangles (and even squares). We can calculate the area of these cross-sections.